What inspired you to create your blog, A Traveler’s Library? Because I love to travel, I read a lot of travel boards on the Internet, and noticed that whenever someone asked a question about a book to read related to a country they were traveling to…the answers poured in. There seemed to be a real need for discussions of literature to accompany travel. In surveying the web, four years ago, I could not find anything like that in a website or blog. Besides, there’s the Puritan ethic. I read all the time, and this makes it a legitimate pursuit instead of just escape. What types of books and movies do you review? Genre doesn’t matter–fiction, non-fiction, even cookbooks and children’s books are fair game, as long as they inspire or inform travel with a strong sense of place and/or culture. I find mystery novels are often the very best guides to a country, since the authors have to be detailed about place. If someone is planning a trip, how can they use the site? If the reader already has a destination in mind, I hope that A Traveler’s Library will enrich the trip, by providing reading suggestions tied to the place. We do not have EVERY place covered, but we’re nearing 1000 posts, and that’s a lot of places. I’m also hoping readers who just enjoy reading about travel in-between or instead of trips, may find a book or several that will inspire them to explore a place they had not considered before. Trip planners will need to go elsewhere for things like hotel rates and itineraries. I review guidebooks only when they are truly unique or have literary worth. (Like one about the markets of Paris, or a classic walking guide to Istanbul). I write about my own travels some times, with info about my own planning, but generally I’m reviewing books that will inspire travel or will help a person understand a place they are going. So, if you’re planning a trip and want literature about a particular country, use the search function for that place and see what comes up. By the way, if you are inspired by music, cultural sites, food, or travel with pets, some regular contributors at A Traveler’s Library have those topics covered. What are two or three of your favorite travel books? I am a devotee of a couple of classic travel writers. Number one is Patrick Leigh Fermor. I love everything he wrote, but my first love is Mani: Travels in the Southern Peloponnese. I love Greece above all destinations and read the Fermor book when we did a road trip through the area in the nineties. Although the book was then more than 50 years old, it held up well. Another favorite for his Greek work is Lawrence Durrell. Although he’s better known for the more literary offerings, I love the photo book called The Greek Islands because it sets me dreaming. Not all the great travel writing is classic, and I’m now privileged to read new books that knock my socks off every month. Since I now read nearly 100 (mostly new) books related to travel each year, it is impossible to pick favorites among current books. But each year in January, I list the previous year’s ten best that I was fortunate enough to review at A Traveler’s Library. What are two or three of your favorite travel movies? Cinema Paradiso, because the Italian island setting looks like the absolutely perfect place to escape to. Woody Allen’s paean to Paris, Midnight in Paris because I’ve looked at a lot of movies about Paris (there are 50 or so made there every year) and this one seems to cover all the moods and high points of the beautiful city. In Bruges, because despite its foul mouth, it shows that city in such an alluring light, that my husband and I had to detour on our trip to France so that we could spend two nights there. What are a few places on your own bucket list? Thanks Irene. Can’t wait to check out A Travelers Library. I Love ATL, and it’s one of the first places I go to when I’m dreaming of a destination. What a great interview – thanks! Interesting to know why you undertook this blog and what it means to you. Glad that you did it. Vera is so well-read and so well-travled, too. What a great combination to enrich any trip- – or take the place of one! I love the idea behind Vera’s blog–finding books to help people be more informed about where they travel, or where they’d like to travel. 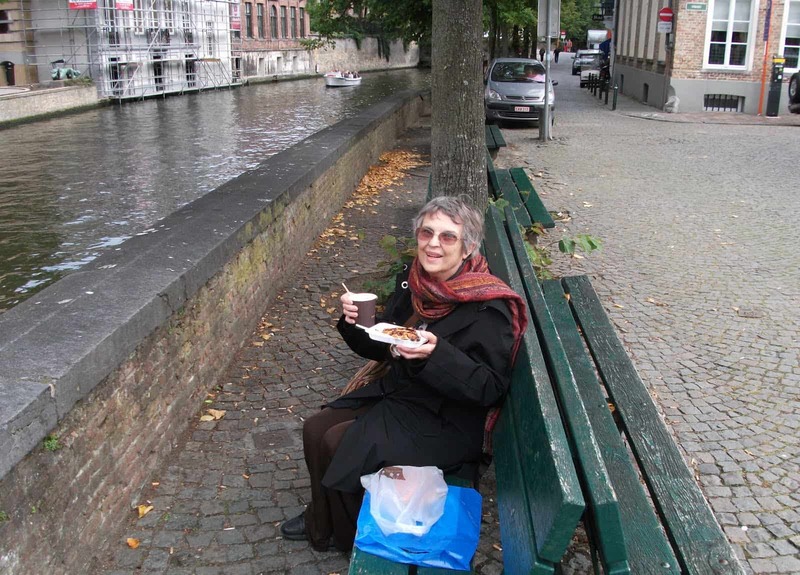 I like reading through Vera’s blog as a way to armchair travel around the world myself.